The ruffed grouse is a medium-sized (16-28 oz. ), chicken-like game bird best known for its courtship displays and thunderous takeoffs. 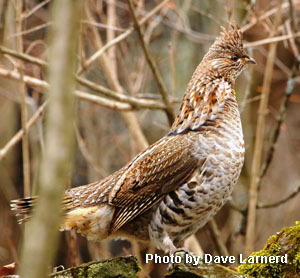 Sometimes refered to as a "partridge", the ruffed grouse is one of 10 species of grouse in North America. The name "Ruffed" stems from the long, shiny, black or chocolate colored neck feathers that are most prominent on the male. The plumages of males and females are quite similar except for an unbroken black band found on the tail of most males along with a slightly longer tail length. There are two color phases of ruffed grouse. The red phase, which is more prevalent in milder climates and the gray phase that is more abundant in winter climates. Although the grouse is an excellent flyer, it spends most of it's time on the ground of young forests using ground cover such as brushy areas and thickets to hide. Many a hunter has been surprised by a grouse bursting into flight when closely threatened. Male "patrtridge" differ from females especially during their spring mating ritual of "drumming" and puffed up feather display similar to the strutting of a tom turkey. A male will stand on a rock, log or stump and begin beating his wings. Slowly at first and then more rapidly, creating a drumming sound used to attract females and warn other males to stay away from his territory. Most frequently done in spring during mating, drumming may also be heard throughout the entire year. Male grouse are extremely territorial and will agressively defend that territtory which can extend to as much as 20 acres. 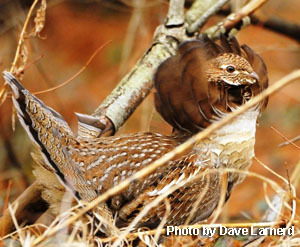 The ruffed grouse has a varied diet, depending on the season. In the summer, seeds, insects, and fruits like blueberries, strawberries, and raspberries are it's main diet. In the winter when these types of food are more scarce, the ruffed grouse mostly survives on the buds and catkins of trees and shrubs such as aspen, cherry, birch, ironwood and apple. Females lay groups of 8-12 eggs, known as a "clutch", in shallow nests made up of leaf litter. Incubation usually takes about 24 days. The newborn chicks leave the nest shortly after birth and will feed and stay with the hens until fully grown.